A chloropleth map is a geographic map where statistical information are mapped to certain areas. Let’s plot such a chloropleth map in this post. 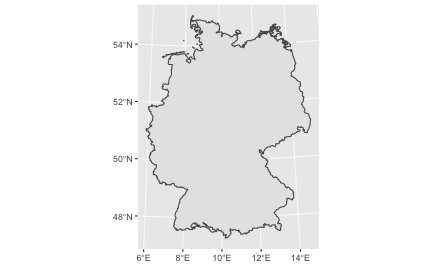 Best place to get German geo data is from the “Bundesamt für Kartografie und Geodäsie (BKG)”. One may basically use the data for a purposes unless it is against the law. I have downloaded the data 2017-10-09. More specifically, we are looking at the “Verwaltungsgebiete” (vg), that is, the administrative areas of the country, ie., counties, states etc. Look for the “Verwaltungsgebiete”. On this page you’ll get the geo data scaled 1:2,500,000. 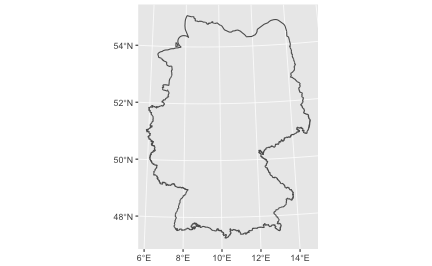 This material includes area map of the whole state (hence sta, see below) of Germany. It’s quite a bit of data. Download it, unzip it and adapt your path variables accordingly. 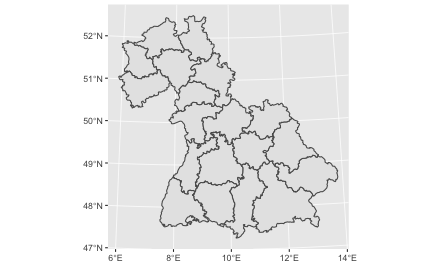 The data is stores as shape files, a standard format for open geo data. st_read comes as a friend, smooth and hasslefree. All geo data is stored in one column: geometry. The other columns provide district data. The most important one here for us at this point is AGZ meaning type of border. Value 1 is national border. All right then, let’s draw the country borders. Note that this time, we have lines, no areas, hence we cannot fill the country with some color. Hmm, this one looks weird; some areas appear to be lost in action. Only 19 Kreises are reported, and no values from northern or eastern part of the country. Strange. Ok, that’s complete. How many of those “Kreise” do we have? Well, 401, that’s the number of rows we have in the data frame. These data can as well be fetched from official sites, that’s in this case the “Bundesämter für Statistik”. 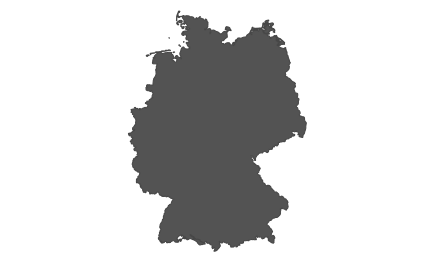 We consider here the unemployment rates of German counties for 2016 as provided by this agency. Presumingly, we will not have a perfect match, but let’s see how good or bad it will be out of the box. 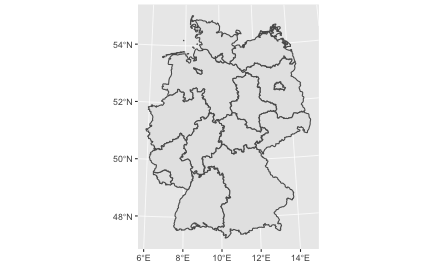 Let’s plot the unemployment rates per administrative area. Appeared to work pretty well; but I have not checked the details yet. 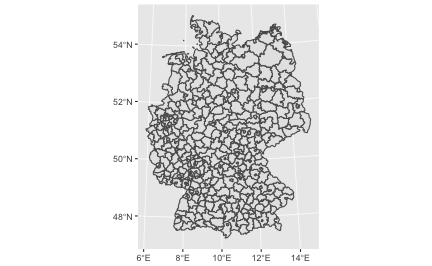 For the top right state, Mecklenburg-Vorpommern, no data were made available by the agency.